Two emails that launched an interagency feud over potentially classified information stored on Hillary Clinton's private email server have been in the public domain since May, CBS News confirms. 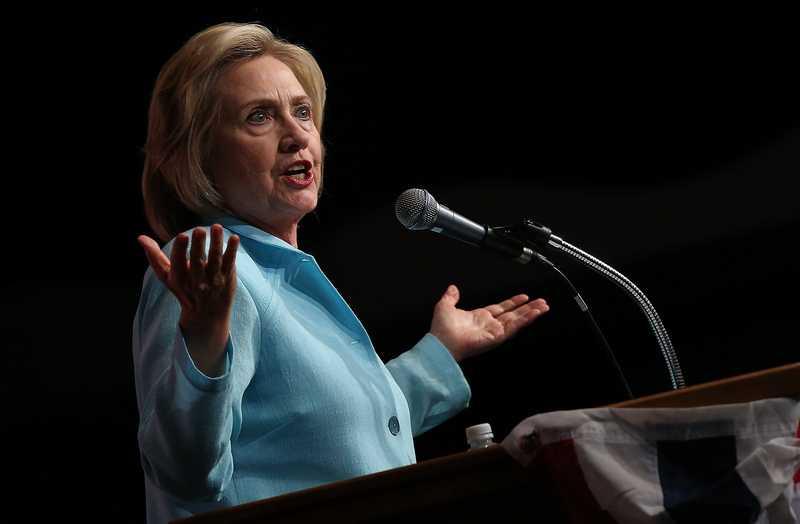 Will Clinton's email server scandal cost campaign donations? The State Department made the two emails public with nearly 300 other messages from Clinton's account relating to the 2012 Benghazi attack. But the inspector general for the Intelligence Community (IC) has since said they should have been marked as "classified" when they were sent. The emails were first identified by Fox News. One of the emails was originally written by the State Department's Timmy Davis in April of 2011 and forwarded to then-Secretary Clinton by longtime aide Huma Abedin. It contained what Davis believed to be sensitive but unclassified information from U.S. Special Envoy to Libya Christopher Stevens -- "(SBU) Per Special Envoy Stevens," according to the email. The email mentioned the diplomat's concerns about departing from Benghazi and also detailed the "phased checkout" of Stevens' envoy delegation from the area. The document, which is entirely unredacted, also includes references to military intelligence. "AFRICOM reported Qadhafi's forces took the eastern and western gates of Adjabiyah, with 5 vehicles at the eastern gate and 50 at the western gate," the email reads. "More Qadhafi forces are heading to Ajdabiyah from Brega." A government official with knowledge of the investigation tells CBS News that this was the section of the email that intelligence officials believe should have been marked "Classified" at the time it was sent. The passage comes in the middle of the email, as Davis relays what Stevens, later to become an ambassador, is telling him about the deteriorating situation in Ajdabiyah. Some of the information Davis divulges are details that Stevens has picked up on his own via observation or local sources. That part would not be considered classified. But the government official tells CBS News that as soon as Davis invoked AFRICOM reporting, what followed should have been considered classified because it was military intelligence that came from a U.S. command headquarters about its tracking of combatant movements in a war setting. It was not information that Stevens had gleaned himself. And Davis had written "SBU" (sensitive but unclassified) at the top of his email, indicating that he did not believe that any of the information he was sharing rose to a classfied level. The government official says that doesn't change the fact that his email, which was eventually forwarded to Clinton, contained military intelligence that should have been marked "classified." "SBU" is a generic State Department classification level that is not used by the rest of the intelligence community. The government official acknowledged that this kind of mistake is not unusual for the State Department when officials are discussing information gleaned from both intelligence and local sources. The difference here, however, is that this email was sent to Clinton's email account and was housed in her personal server, which may have had vulnerabilities to infiltration that a government account does not. Another email, forwarded by Clinton's deputy chief of staff Jake Sullivan in November 2012, contained information on reports of Libyan police arresting people who may have had a connection to the Benghazi attack. Several lines of the original message are redacted, and a note on the email reads that it was "[c]lassified" earlier this year. Both Sullivan and Abedin now work for Clinton's presidential campaign. Clinton's press secretary Brian Fallon, appeared to dismiss the identification of these two disputed emails on Wednesday. Fallon commented on Twitter that "they are both emails State Dept has already said were unclassified at time." Fallon went on to defend the emails in a call with reporters late Wednesday afternoon. "We think it indicates our point that former Secretary Clinton did not send or receive classified materials," Fallon said. "Rather what is taking place in this review of her email server is really a case where you have members of the Intelligence Community erring on the side of classification when other agencies in the government acting in perfectly good faith have a completely different view of the nature of the underlying information." Clinton directed her staff to turn her old email server over to the Department of Justice last Tuesday, and the next day, the FBI picked up the server from a New Jersey data center where the server had been stored. David Kendall, Clinton's lawyer, told a Senate committee last week that the computer server was erased before it was turned over to federal authorities. "That equipment is no longer active and, we understand, no longer contains data from Secretary Clinton's hdr22@clintonemail.com account," Kendall wrote in a letter to Sen. Ron Johnson, R-Wisconsin, Chairman of the Senate Homeland Security and Governmental Affairs Committee. "All preservation notices related to the equipment were shared with the Platte River Networks, which confirmed its acceptance of and compliance with such notices." In the letter, dated last Tuesday, Kendall also states that he and his law partner, Katherine Turner, were the only two people to have access to a secure thumb drive that retained backup copies of Clinton's emails. The drive was kept in a safe installed by the State Department in early July and was later handed over to the Justice Department the next month. Kendall added that both he and Turner held Top Secret clearances "issued by the Department of State." Despite Kendall's assurances, the Clinton attorney's involvement has only raised further questions for those investigating the server. In a letter sent to the Clinton lawyer earlier this week, Judiciary Committee Chair Sen. Chuck Grassley, R-Iowa, asked for further information probing the nature of Kendall's security clearance. "The transmission of classified material to an individual unauthorized to possess it is a serious national security risk," Grassley wrote. "Moreover, if a person unauthorized to maintain custody of the classified materials does in fact maintain custody, it raises legitimate questions as to whether the information was properly secured from foreign governments and other entities." While on the presidential campaign trail, Clinton has maintained that she and her staff had not broken any laws. "The State Department has confirmed that I did not send nor receive material marked classified," Clinton said during a visit to the Iowa State Fair over the weekend. "This is not about me. They have also confirmed that." CBS News' Paula Reid, John Nolen, and Hannah Fraser-Chanpong contributed to this report.